After recently finishing up his stellar collegiate career at Cornell, Gabe Dean was certainly not a man without options. 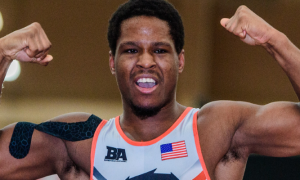 The two-time NCAA Division I National champ and four-time All-American jumped back into freestyle in April for the first time since his run on the Junior World Team in 2014, placing seventh at the US Open — not bad considering the time off from Senior competition along with the cavalcade of assassins who were present at 86 kilograms in Vegas. The line of thinking was that Dean, the wrestler with jump-off-the-page gifts which spring to life whenever he is on a mat (any mat, as it were) would ply his trade further into the freestyle realm, pay his dues, and see what shook out by the time Tokyo in 2020 comes around. Just remove the freestyle part of the equation. Dean has confirmed that he will be competing as a Greco-Roman athlete for at least the foreseeable future. Naturally, the news is big for the greater American Greco community. The chips don’t get a whole lot bluer than this guy it would seem. Plus, Dean has shown that he can hang. Don’t you remember? The 2015 Pan Am Championships? The silver medal performance on just a couple of weeks’ preparation? You saw it then — dominant snaps, go-behinds, guts…he broke it all out that day in Santiago, Chile. And ever since then, we’ve wondered: would Greco-Roman become a point of attraction for Dean once his days at Cornell were through? Thankfully, now we have that answer. There is bound to be much more conversation regarding Dean’s move over to Greco and its perceived implications. That’s fine. 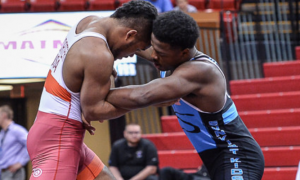 But the bottom line is that the United States Greco-Roman program just got better. The attitude is shifting and Dean is the latest example of that. We caught up with Dean earlier today to see what prompted him to make the move, what’s he looking forward to and of course, when he’ll be competing. 5PM: Why now? 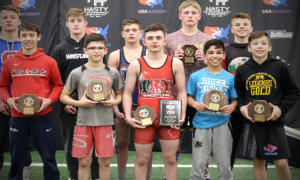 What made you come to this decision now when obviously, most, if not all of the country expected a run in freestyle for 2020? Gabe Dean: For me, there was more opportunity with the way things were going. Like how I’ve been approaching the sport. There’s going to be a little bit of a change, but I’m looking forward to it. It’s going to be new and exciting, and I’m just going to roll with it. 5PM: How did your experience at the 2015 Pan Ams play a role in your decision? GD: I’m pretty inexperienced in Greco. I gave it a try training for two weeks before the Pan Ams. I didn’t do that bad and thought, Okay, well, maybe this is an option for me when I’m done with my college career. Now what do you know, here I am. It definitely played a role, I’d say. I connected with the guys, they supported me, they helped me, and they encouraged me. 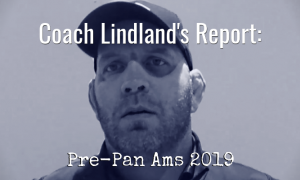 Coach Lindland was also great. I enjoyed it. 5PM: How does your specific brand of wrestling translate to Greco? Your hips, balance, and strength are obvious attributes, but how do you look at the process of making adjustments to deal with the top competition from overseas? Gabe Dean: First of all, I have a lot to learn, there’s no doubt about that. Even freestyle, too, I’m still learning. I didn’t do any in high school and only a little in college. I plan to pay attention to detail and prepare the right way. I trust in my coaches and there’s a lot of support coming my way, which is great. Basically just doing everything the right way. That also translates to everything in my life. That’s the approach I use. 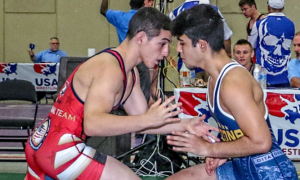 5PM: What is your number one skill that you think will translate well to Greco? GD: Hand-fighting, that’s the number one thing. 5PM: Are the people in your life, be them friends, family, and teammates, understanding of your decision? GD: Yes, very. Everyone’s been very supportive. I’m very lucky. I have overwhelming support from the community and from Cornell. It’s going to be fun to try and make an Olympic team, for sure. I feel blessed to have the opportunity, extra-blessed knowing I have such amazing support around me. 5PM: What excites you about the direction of Greco in the US? There are more and more athletes coming over even prior to college, but there seems to be an uptick of really talented collegians coming over. Is that due to a perception that the tide is starting to change? GD: I think Matt Lindland is doing a great job. I enjoy him and his charisma, and the way he approaches the sport. A lot of great athletes are moving that way. I think we as a program are moving in the right direction. I want to help the US and build the movement. I think it’s all good stuff. A lot of good things are happening, for sure, and I’m glad I get to be a part of it. 5PM: Do you think you’ll be a catalyst for other top NCAA athletes to make the switch? Gabe Dean: I don’t know, I really don’t know. Hopefully. That’d be good, though I’m not sure l how much pull I have. I never looked at myself that way, but I hope so. 5PM: When do you see yourself competing? New York in the fall? The Open in December? 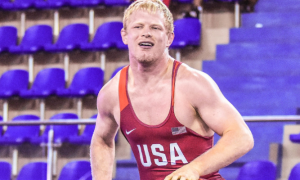 When is Gabe Dean re-entering the Greco-Roman atmosphere? GD: Good question. I’ll probably train into the fall. I need to get myself back into good shape. In the early winter, there is an overseas trip. I’ll start then probably. I’m just following directions, I just do as I’m told. I’ll let them take care of that. 5PM: On a scale from 1-10, how busy is your summer schedule? GD: Generally, I’m pretty busy. I like to hop around and do a lot of camps. I like to see the kids and help the youth as much as I can. I jump around a lot. I still train, just less rigorously. I still lift and go for runs, I like getting on the mat when I can. My dad runs his company and I’m trying to work myself into that. I stay pretty busy, at least I like to think so. It keeps me young. 5PM: What’s the one takeaway you want fans and aspiring athletes to know about this new direction in your career? GD: I think one thing is, is that people get hung up when something doesn’t work out. They stop pursuing their goals and lose sight of a lot of good things. There’s a lot of adversity in this sport. When things don’t go your way, there’s room to change and you can go in a new direction you could still have a lot of success in. You can always learn. I don’t even know if I’m going to make a team at all, but my biggest thing is that I don’t want to walk away wondering What if? I think that through every adverse moment, you have to see the opportunity on the other side. You have to chase it. You might fail, but I have to know. I can’t wonder what if? When one door closes, another opens, or so they say. I just roll with the punches. 5PM: Do you have any specific Greco goals moving forward? GD: You know, not really. I just want to see how good I can get. I’ll keep it that simple and let the rest take care of itself. I just try to be as perfect as I can be. 5PM: At this point, where will the brunt of your training take place? 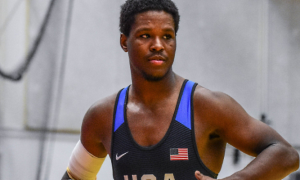 Gabe Dean: I’ll be in NYC still for at least another year. My brother is out there. He’s going to start his college career at Cornell. He’s a high priority, his teammates as well. I want to help them accomplish their goals, too. I’ll probably take trips to (Colorado) Springs, as well, but NYC will be my homebase. Follow Gabe Dean on Twitter and Instagram to keep up with his career and competitive schedule.